A powerful force of nature, a body in motion, passed from the scene this week, a fighter till the end. Felicia Michalski was a Holocaust survivor running for her life at the age of 19, but she staunchly refused to be cast as a victim, determined to survive and thrive. Hardened by the contradictions of life, she was a warrior for justice and at five-feet-two stood taller and stronger than any team of men. Her life story defied all common sense because hers was the story of spirit, hope and faith and an intense desire to survive. With her husband Joseph they never looked back, fully embracing the blessings of American freedom and opportunity, determined to educate their three boys and “make it” in their beloved new home. Never shy about expressing her thoughts, opinions or wishes, Felicia was remarkably independent in a world that did not value or acknowledge strong capable women. At the outbreak of the Second World War, Fela Kuvent and her brother Yaacov (Uncle Kuba) ran for their lives from their native Poland. Making their way through Poland to Ukraine in the depths of winter, they escaped capture by the Nazis several times. Ironically, the Russians captured them and sent them to Siberia as slave laborers. When their camp was needed to house captured Nazi soldiers, the civilians were released. She led in the construction of two large rafts fashioned out of tree logs. They floated down several Siberian rivers for two weeks with many escapees dying along the way. Near death herself, she and her brother arrived in Dzumbul, Kazakhstan. A few miracles later, her betrothed, Josef Michalski, also from her village of Gostynin, found her dying of typhus fever. He nurtured her back to health, and soon they married and had two sons in Dzumbul, Jerry (1943) and Henry (1945). Back in Europe, the horrors of the Holocaust which consumed their entire families were revealed, making emigration to a safe country imminent. For three years the young family lived as refugees in a DP (Displaced Persons) camp. After years of paper work, the United States finally granted permission for the Michalski family to settle in America. Eager to start a new life, one of hope and opportunity, they never looked back, instead instilling in their sons a love of American values and the promise of a better life. After a difficult year in New York, the family moved to San Francisco where in 1952 George, named after Felicia’s father Gershon, was born. Felicia spoke more than six languages and possessed a keen eye and a sophisticated taste for beautiful objects d’art. Self-taught, she mastered the art of collecting and became an expert in many areas to the point where dealers and curators sought her opinion. Above all, she deeply loved and was proud of her three sons: “My three hot boys, my dear little chickens”. No one worked harder than Felicia and Joseph in providing for their family, truly the last of the Greatest Generation. 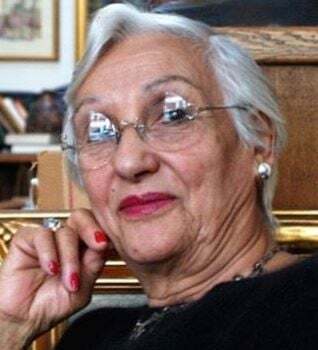 Felicia was preceded in death by her adoring husband Joseph of 54 years, her beloved brother Kuba and sister-in-law Tova of Israel, and her oldest son Jerry who passed away in 2014. She is survived by her sons Henry (Lynn), and George; three grandchildren Wendy (Ryan), Elaina and Geoffrey (Meghan); four great-grandchildren Bryson (7), Caleb (5), Dylan (5), and Jacob (2); and her nephew Reuven (Mirella) and niece Zahavah of Tel Aviv. Anyone who has met Felicia cannot forget the experience. She was charming, straightforward, deeply intelligent in the ways of the world and of human behavior, and had no time for pills, ills, or fools; preferring the arts, culture and a meaningful conversation. May her memory be for a blessing.